Produced by Changes in 2011, this is a licensed large metal 3-D reaper emblem belt buckle. It measures 4″ x 4″ x 1/2″ and is cast in a grey metal zinc alloy in relief. This is a buckle with durable finish that fits standard adjustable belts up to 1 1/2″ wide. This is a new, never used, 1:18 scale die-cast reproduction of the motorcycle ridden by Clarence “Clay” Morrow on the hit TV show The Sons of Anarchy. It comes in a sealed display box and is stored in a smoke and pet free environment. 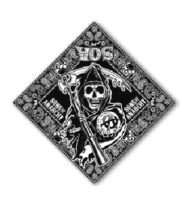 Produced by Changes in 2011, this is a licensed grim reaper emblem cloth bandanna with the Sons of Anarchy name along the sides with a paisley design. It measures 21″ x 21″. This is a new, never used, black 22 ounce ceramic coffee mug that has a metallic decal of the reaper logo above the series name on each side from the hit TV show The Sons of Anarchy. 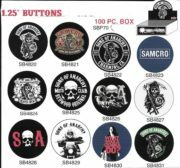 This is a licensed set of 100, 1.25″ wide metal buttons featuring multiple different images from the cult hit TV series Sons of Anarchy. 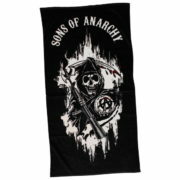 This is a black and white beach towel that depicts the image of the Reaper logo from the hit TV series Sons of Anarchy. 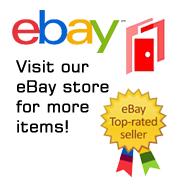 It is 100% cotton terry cloth and measures 59″ x 29 1/2″. 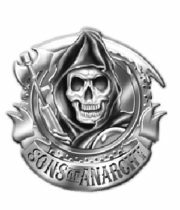 Produced in 2013, this is a licensed, large 2 1/2″ x 3 1/2″ magnet featuring the image of the Reaper logo under the TV series logo Sons of Anarchy. 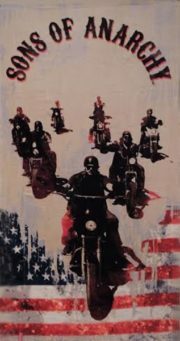 This is an off white beach towel that depicts the image of the Sons of Anarchy logo above the American Flag and motorcycle riders from the hit TV series Sons of Anarchy. It is 100% cotton terry cloth and measures 59″ x 29 1/2″. 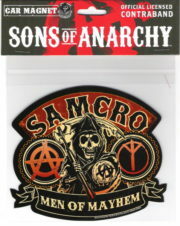 Produced in 2013, this is a licensed, large 2 1/2″ x 3 1/2″ magnet featuring the image of the SAMCRO Men of Mayhem Reaper logo from the TV series logo Sons of Anarchy. 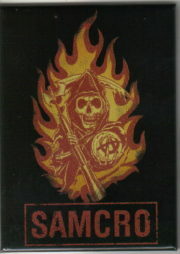 Produced in 2013, this is a licensed, large 2 1/2″ x 3 1/2″ magnet featuring the image of the SAMCRO Reaper logo in flames from the TV series logo Sons of Anarchy. 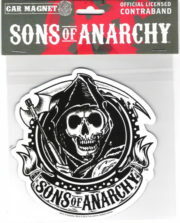 Produced in 2013, this is a licensed, large 2 1/2″ x 3 1/2″ magnet featuring the logo of TELLER-MORROW Automotive repair from the TV series Sons of Anarchy. Produced by NMR in 2013, this is a licensed 3-D die-cut magnet measuring 3″ x 3″ x 1/4″ that features the reaper from the popular TV show Sons of Anarchy. 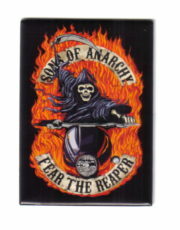 Produced in 2013, this is a licensed, large 2 1/2″ x 3 1/2″ magnet featuring the image of the Fear The Reaper logo from the TV series Sons of Anarchy. 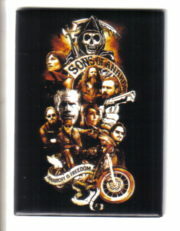 Produced in 2013, this is a licensed, large 2 1/2″ x 3 1/2″ magnet featuring the image of a group montage of characters with the logo from the TV series Sons of Anarchy. 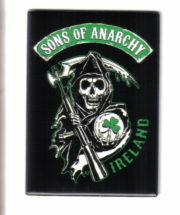 Produced in 2013, this is a licensed, large 2.5″ x 3.5″ magnet featuring the image of the Ireland logo being held by the grim reaper from the TV series Sons of Anarchy. 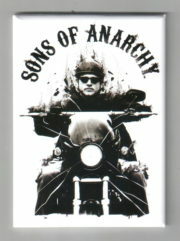 Produced in 2013, this is a licensed, large 2 1/2″ x 3 1/2″ magnet featuring the image of Jax riding on a motorcycle from the TV series Sons of Anarchy. 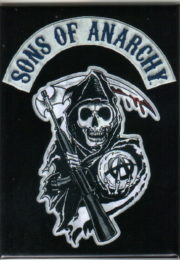 Produced in 2014, this is a licensed, large 4.5″ x 5.5″ car magnet featuring the image of the Men of Mayhem logo from the TV series Sons of Anarchy. Produced by Hot Properties in 2014, this is a licensed metal keychain which features the Moto Club logo from the hit TV series Sons of Anarchy. The fob measures 1.75″ x 1.75″ and is cast in a grey metal zinc alloy in relief. This is a 2 ounce clear shot glass featuring the name above the reaper logo of the hit TV show The Sons of Anarchy. 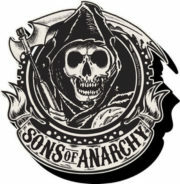 Produced in 2014, this is a licensed, large 5.5″ x 5″ car magnet featuring the figure image of the popular Reaper above the words “Sons of Anarchy” from the TV series Sons of Anarchy. 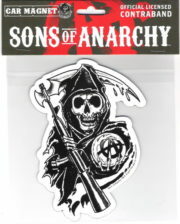 Produced in 2014, this is a licensed, large 6″ x 4.25″ car magnet featuring the figure image of the popular Reaper logo from the TV series Sons of Anarchy. 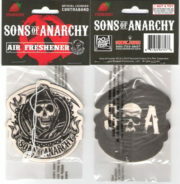 Produced by Hot Properties this is an air freshener featuring the famous Reaper logo from the popular TV Series Sons of Anarchy. 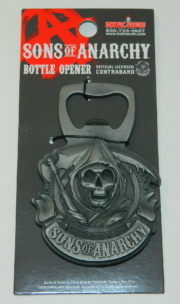 Produced by Hot Properties in 2014, this is a licensed metal bottle opener which features the Reaper logo from the hit TV series Sons of Anarchy. The bottle opener measures 3.5″ x 2.5″ and is cast in a grey metal zinc alloy in relief. This is a new, never used, plaster freezer style red frosty mug with the reaper A logo on each side from the hit TV show The Sons of Anarchy on the front.